You are here » frostvalley.org » Overnight Camp » Camp Henry Hird » Tacoma and Lenape at Tokyo Night! Tacoma and Lenape at Tokyo Night! Tonight was Tokyo Night, one of the best nights of the summer! 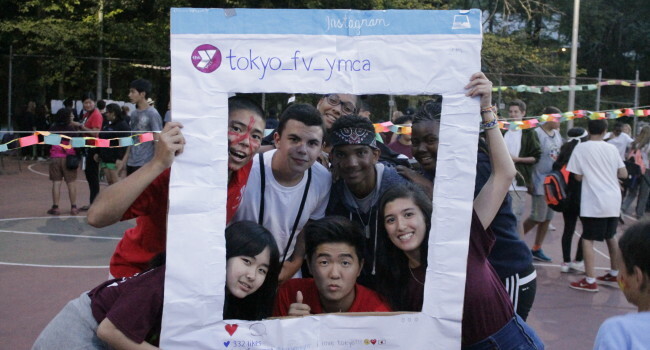 Frost Valley’s Tokyo Partnership provides an opportunity for Japanese children from both Japan and the US to have a great summer camp experience while also immersing themselves in Japanese culture. On Tokyo night the partnership’s counselors collaborate to share Japanese culture with main camp. There was face painting, character writing, origami, and of course the Fisherman’s Dance. All villages have the opportunity to visit the hard courts and explore another culture. Pictured above are a few Tacoma and Lenape campers mingling with the counselors and enjoying the various booths.